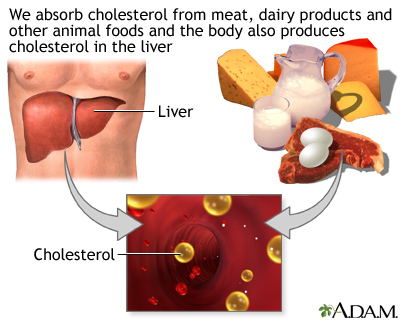 Cholesterol is a fat (also called a lipid) that your body needs to work properly. Too much bad cholesterol can increase your chance of getting heart disease, stroke, and other problems. The medical term for high blood cholesterol is lipid disorder, hyperlipidemia, or hypercholesterolemia. Smoking does not cause higher cholesterol levels, but it can reduce your HDL (good) cholesterol. 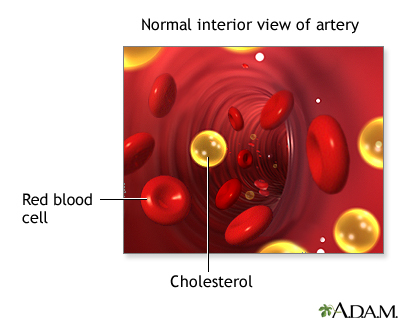 A cholesterol test is done to diagnose a lipid disorder. Different experts recommend different starting ages. Adults with normal cholesterol levels do not need to have the test repeated for 5 years. Repeat testing sooner if changes occur in lifestyle (including weight gain and diet). It is important to work with your health care provider to set your cholesterol goals. Newer guidelines steer doctors away from targeting specific levels of cholesterol. Instead, they recommend different medicines and doses depending on a person's history and risk factor profile. These guidelines change from time to time as more information from research studies becomes available. Quit smoking. This is the single biggest change you can make to reduce your risk of heart attack and stroke. Use low-fat toppings, sauces, and dressings. Avoid foods that are high in saturated fat. Almost everyone else may get health benefits from LDL cholesterol that is lower than 160 to 190 mg/dL. There are several types of drugs to help lower blood cholesterol levels. The drugs work in different ways. Statins are one kind of drug that lowers cholesterol and has been proven to reduce the chance of heart disease. 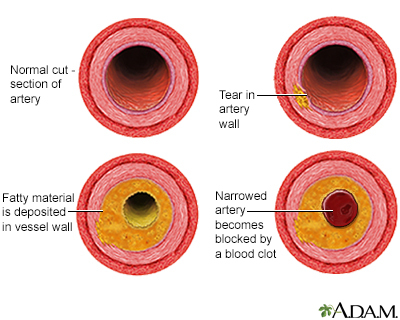 High cholesterol levels can lead to hardening of the arteries, also called atherosclerosis. This occurs when fat, cholesterol, and other substances build up in the walls of arteries and form hard structures called plaques. Over time, these plaques can block the arteries and cause heart disease, stroke, and other symptoms or problems throughout the body. Disorders that are passed down through families often lead to higher cholesterol levels that are harder to control. US Preventive Services Task Force recommendation summary. Statin use for the primary rrevention of cardiovascular disease in adults: preventive medication. www.uspreventiveservicestaskforce.org/Page/Document/UpdateSummaryFinal/statin-use-in-adults-preventive-medication1. Updated November 2016. Accessed March 21, 2018. US Preventive Services Task Force, Bibbins-Domingo K, Grossman DC, Curry SJ, et al. Screening for lipid disorders in children and adolescents: US Preventive Services Task Force recommendation statement. JAMA. 2016;316(6):625-633. PMID: 27532917 www.ncbi.nlm.nih.gov/pubmed/27532917. For generations, my family suffered from cardiac disease and stroke. Now, thanks to Penn Medicine, I've broken that pattern. And even better, I've helped my mother and my brother break that pattern, too.